The production of six major oil companies. The production of six major oil companies since 1999! To understand the production of oil must first know that it is not oil production issue, but fluid and oil equivalent! 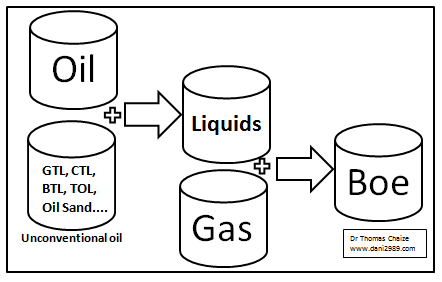 Whether for global oil production, or production of a large company, it is always about liquids is not oil. Production BOE (Barrel Of Oil Equivalent) is a kind of sandwich book in which we add the production of liquid and gas production. Gas conversion barrel Boe this fact on a "spa" and non-financial, yet oil is much easier to carry and use than gas. For example, the company x has a production of 6 million barrels BOE, 3 million of liquids. Translation: half of its production is gas and the other half are liquid, from its liquid is only part of conventional oil. On the chart below if you can observe the evolution of production combine six major oil companies. You will notice that production From (liquid plus gas) had two peaks in 2006 and 2009, the 2009 summit is slightly higher than the peak of 2006. Liquids production also has two peaks, one in 2006 and one in 2009. But the 2009 is lower than that of 2006 as liquids production decline since 2006. Liquids production of the six major companies is +/- 9% of world oil production. The rest is produced by national companies (especially) or smaller companies (some). Even if they are "only" 1 / 10th of the world production have his companies, most centenarians, who have the technical and financial capacity to adapt. 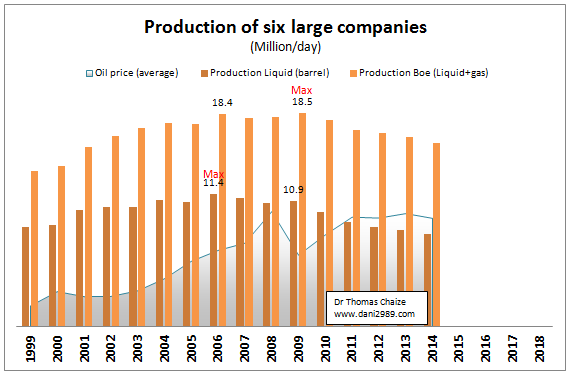 And despite rising prices in 2008 and 2011-13 production BOE down a bit, their liquid production decline and probably much lower than their conventional oil production tremendously! 1 despite the growing share of natural gas production Boe decreases. 2. The liquid share in production Boe is becoming weaker. She represented 63-4% in 1999-2001, today it is only 50%. His big companies are the most dynamic part of the oil production, liquid production fell in an environment (increase in 2008 and 2011-13). This is indicative of the "fragility" of world oil production. "Believed in oil, fall is not a reason to fear but an opportunity to buy"